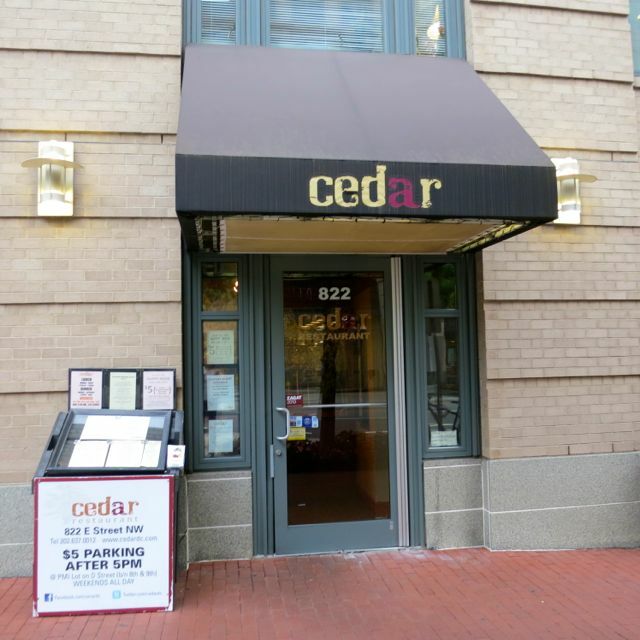 Cedar has intrigued me since it began participating in Meat-Free Week in DC. 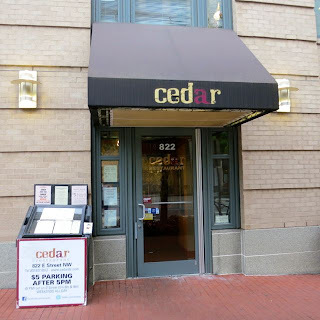 As an older, more established restaurant in the Penn Quarter area, it is now trying to branch out to please the local vegan clientele. Located on E Street, it isn't where I normally go to find restaurants when I'm dining in this neighborhood. I saw the simple brown awning from afar and soon entered into the dark abyss. Down a spiral staircase I went to find a host awaiting me at the bottom. She informed me that they had a very nice table prepared for me and my friend and I was excited to see it nestled in the corner of the 70-seat restaurant. Pictures of the forest adorned the walls complemented by cedar wood panels. The stone walls near the bar gave the restaurant a rustic feel while the dim lighting contributed to the intimate, romantic atmosphere. I liked it already. As another host seated me and handed me the menus, I inquired about the vegan menu. He brought it to the table and immediately informed me that he knew two of the wines were vegan -- the Witness Tree Pinot Noir by the glass and the bottle of Mourvedre, Cline Ancient Vines from Contra Costa County, CA 2011. I tried the Pinot and found it to be too light at which point the server told me they'd open the bottle of Mourvedre for me if I wanted to order it by the glass. Wonderful! I must say that I was super impressed with their knowledge of the vegan wines. 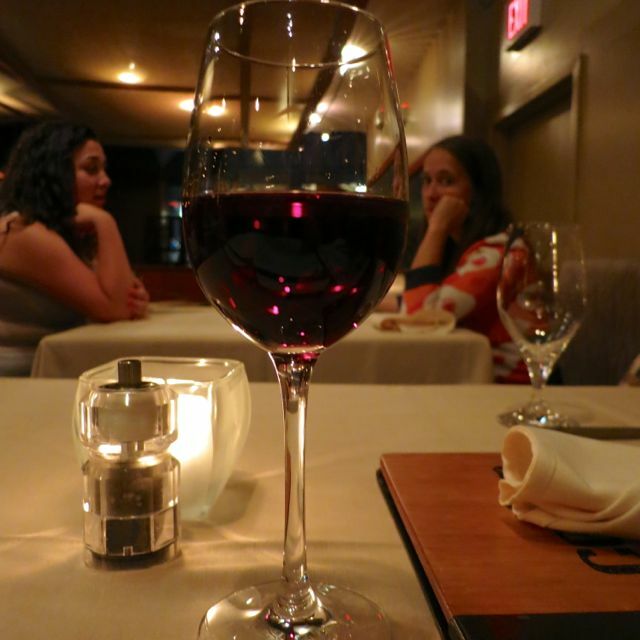 Most servers have no idea whether their wines are vegan or not. Major kudos. Me and my friend went with the 3-course meal, which allowed us to choose from two items for the first two courses while there was only one item for the dessert. 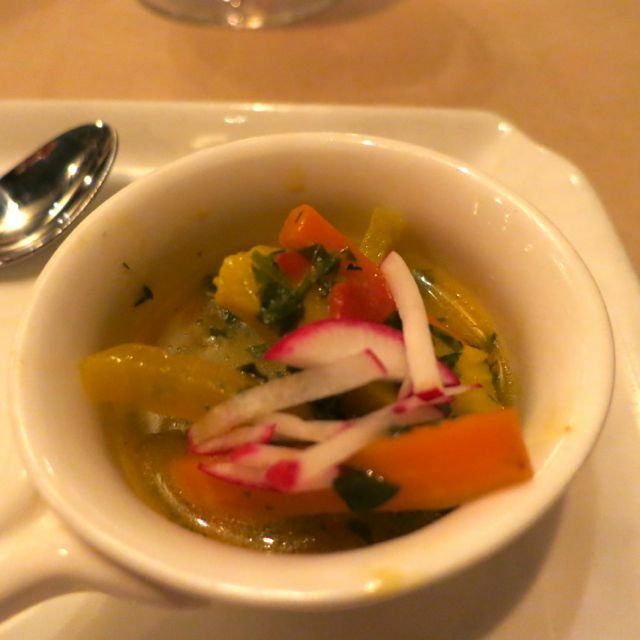 To begin, we were served an amuse bouche of artichoke with saffron and radishes. This was a nice start. 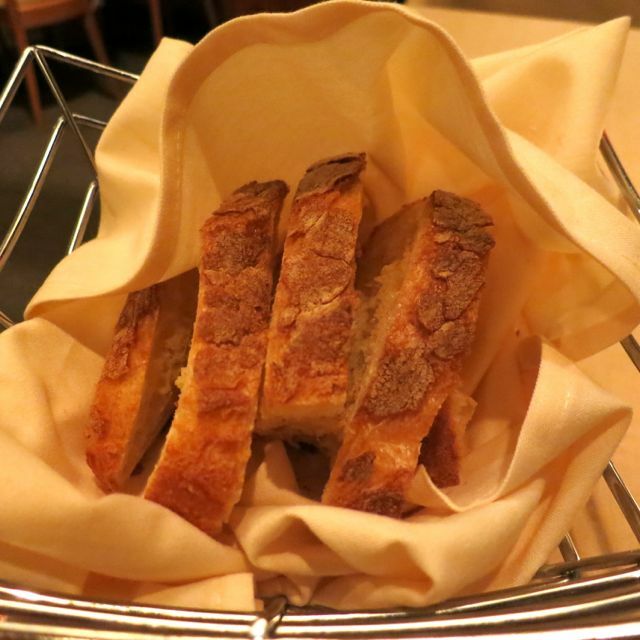 We were also served some delicious fresh bread from Lyon Bakery with olive oil and sea salt. 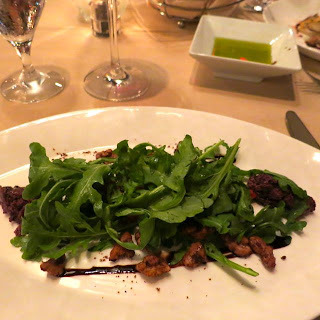 For my first course, I started with the Arugula and Greek Olives salad, which had roasted pequillo peppers under a bed of arugula with diced kalamata olives on either end surrounded by toasted walnuts. It wasn't quite what was described on the menu as there weren't any pine nuts, but that was fine. I thought it was good, but not quite balanced as there were a bit too many peppers and olives and not enough arugula. For my second course, I went with the Truffled White Bean Puree & Morels. 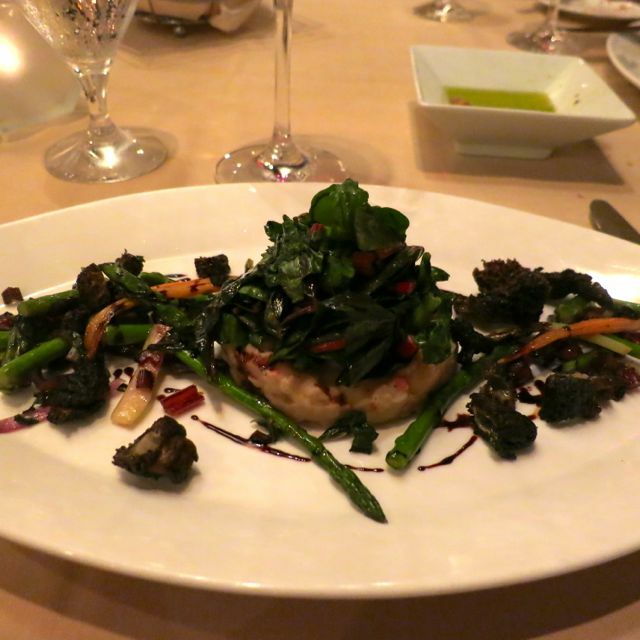 This dish had truffled cannellini beans under a bed of sauteed swiss chard with spring vegetables, morel mushrooms, and a truffled vinaigrette. I really enjoyed the spring vegetables and mushrooms, but the bean puree and swiss chard left something to be desired. I think this dish could be developed into something wonderful, but it isn't quite there yet. Lastly, there was the star of the show. 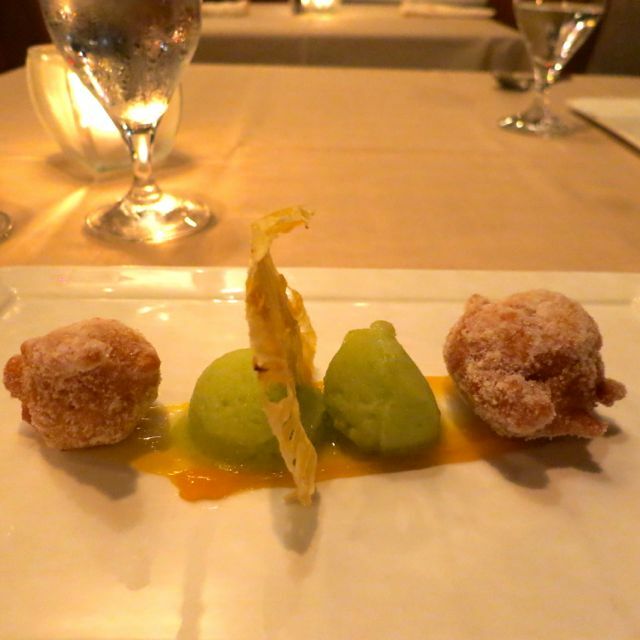 Vegan beignets served with sorbet and a crispy pineapple slice. This dessert was excellent and just the right balance of cold sorbet with warm beignets with a passion fruit sauce. Loved it! The server shared with us the chef's philosophy of serving what one might find in the forest so he keeps it pretty natural while showcasing the bounty of the great outdoors. All in all, I think this restaurant is on the right path though some of these seasonal dishes need a little tweaking. One can't overlook the fact that they identified their vegan wines and have gone out of their way to offer a separate vegan 3-course menu as that is more than most restaurants in DC have done. For $35, I think this was a good meal for the price point and I hope to be able to dine here again in the future as the menu changes each season. The meal is so nicely presented! The dessert looks amazing.